With the announcement of the iPad 3 (probably) just days away, it might be a good time to think about saving a little green. Fortunately, long standing finance mag Kiplinger's is right there with a lil' help for you on that. Though the new KipTips App ($1.99 right here) probably won't be able to get you a new iPad on the cheap, it will offer iPad owners of all kinds a massive range of tips and tricks to help keep prices down on everything from picking the right rewards card for purchases, to figuring out mortgage rates and health care costs. If you're about to upgrade your 'Pad, you could probably use a few ways to save some cold, hard, cash. From beating pesky bank fees (KipTip 20) to checking your credit report (26), making a million (63) to fighting unfair property tax bills (70) and landing the best travel deals (88), Kiplinger’s Top 100 Money-Saving Tips app for the iPad will help you save—and grow—your money. Tapping into decades of expertise, the unique app features Kiplinger’s best advice on credit, budgeting, saving, investing, spending and much more, enhanced with graphics and interactive tools. 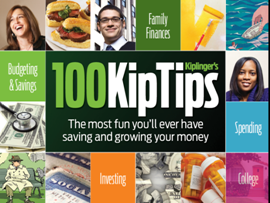 The exclusive iPad app expandsKiplinger’s Personal Finance magazine’s April cover feature, “50 Top Money Tips” and coincides with Financial Literacy Month, which is observed in April. The app got off to a fast start, vaulting to the top of the best-seller list among finance apps right after it became available in Apple’s App Store.